I have been meaning to go out and make pictures of a Boston snow storm for at least the last few times we have had the white stuff fall. Yesterday I finally went out and did so. My plan was to go downtown and photograph hoards of people hustling though the falling flakes. I was thinking about shooting kind of loose along with a telephoto lens to compress the falling snow and people. Unfortunately Boston being the heat island it is made that impossible. The five miles from my house to downtown is all it took to turn the snow falling in my neighborhood into rain. 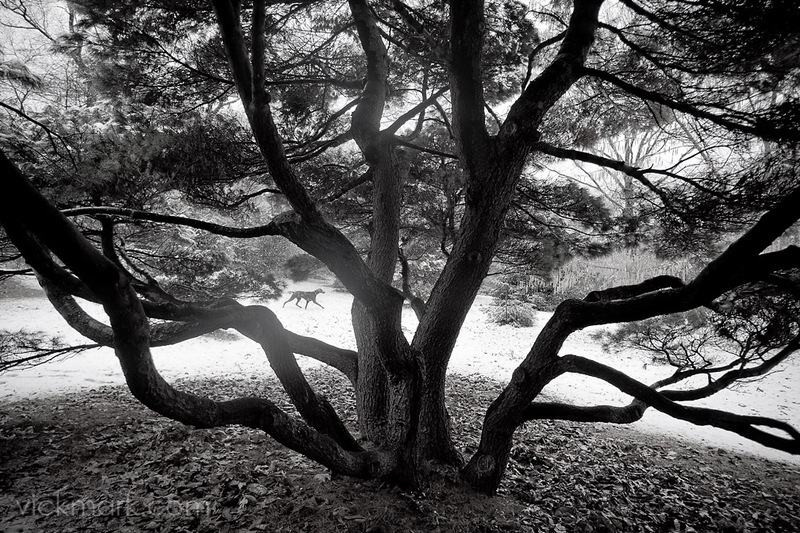 So I headed back toward my place and decided to photograph in the Arnold Arboretum in Jamaica Plain. I did not get to make the photo that I had in my head since there was almost no one there but a dog was kind enough to help me out.